Did anything catch you by surprise this week? Maybe a snowstorm? Or having to reschedule travel? Or all of a sudden having your kids home from school for several days in a row! Even if it’s not weather related, there’s bound to be something that catches us off guard this time of year. We’ve spent the fall months scheduling and getting our caseload in order, working to assess and qualify new students, and meet census deadlines. The New Year comes around, and we feel like we’ve found our stride. Should be smooth sailing from here to the end of the year, right? Wrong. There will undoubtedly be a tweak to the school-wide schedule, an assistant who is out on an unexpected leave, or five new students who have just transferred in. Four of whom, undoubtedly, have three-year reevaluations due this month. So what do you do when your balance feels so precarious that any one of these unexpected events could shake your world and knock you off your game? First of all, take a deep breath. You have made it through challenges before. And this too shall pass. Second, take a look at your priorities. If you’re anything like me, you have a list a mile long. Some items on your list are non-negotiable, others are things you’d really like to get to. Some are tasks that have been assigned by others, some are things you need to do for yourself. Some you might even be already behind on. The unexpected events have likely changed what you can accomplish and you must look at your list and manage the change. This means acknowledging that not everything is equally urgent. And you can either make decisions about what will happen and what won’t, or you can let things happen to you. If you feel like nothing in negotiable, then it is a good sign you need to ask for help. Which brings us to the last important step. Communicate your plan. We’re the communication experts, right? If you don’t see a way through your to-do list, you need to talk to someone – and soon! If you do have a plan, letting other people know that you’ve had to make some changes is important. They might have their own opinions on what you should do, or they may point out factors you hadn’t considered, but at the very least, you will have been proactive in alerting your partners to the change. Instead of making your changes quietly and hoping that no one notices, your partners are prepared and you look like you’re in control. We can’t do everything, but we are infinitely better off when we can consider the situation, make proactive decisions, and communicate our plan to those involved. 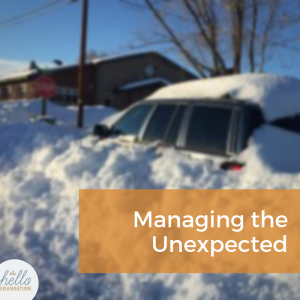 What unexpected event has caught you unprepared this year? How have you handled it?